St. Louis home sales (the 5 county core market*) in August increased 2.4 percent from the month before and were up over 13 percent from a year ago (see chart below), following the trend in U.S. home sales as reported today in the existing home sales report from the National Association of REALTORS®. According to the report, U.S. home sales in August increased 7.8 percent from July and were up 9.3 percent from the year before. St. Louis home prices rose 2.7 percent in August from the month before and were up 6.8 percent from the year before falling a little short of U.S. home prices which increased 9.5 percent in August from the year before but still showing positive signs of recovery for the St. Louis housing market. 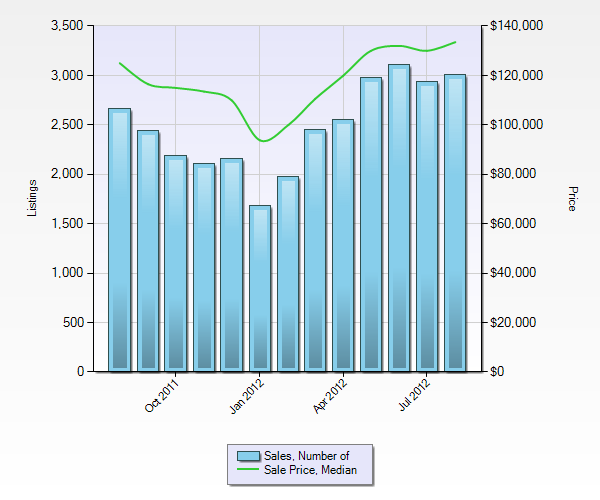 As the chart above illustrates, St Louis home sales in August, 2011 were at 2,661 home sales and in August 2012 St Louis home sales hit 3,009. St Louis median home prices were $125,000 in August 2011 and had increased to $133,500 in August 2012. * The 5 county “core-market” of St. Louis includes the city of St. Louis as well as the counties of St Louis, St Charles, Jefferson and Franklin.